Next weekend, the Harris Theater for Music and Dance will host two outstanding Chicago-based dance companies, Deeply Rooted Dance Theater on Nov. 1 and Natya Dance Theater on Nov. 2. Each company will present a new work inspired by real-life stories with spiritual themes. Deeply Rooted Dance Theater creates world-class dance inspired by the African Diaspora in a community dedicated to nurturing artists, supporting human relationships and sharing common values through engaging in dance. Their new piece, Hadiya, created by choreographer Nicole Clarke-Springer will premiere on Friday. Hadiya began as an exploration of spiritual connection. The name came from the real-life tragedy that occurred this past winter. "On January 29, 2013, 15-year-old Hadiya Pendleton was shot in the back and killed while standing with friends inside Harsh Park in Chicago," said Clarke-Springer. "The event really hurt me as a mother... I did not understand how something like this could happen. Where was the disconnect? It made me think of how I pray every morning over my daughters, just as I'm sure her mom did; and I know my mother prayed over me. I would have a spiritual guide, these guardian angels, like bodyguards." The piece itself is steeped in his concept. Paired dancers take turns whispering and listening to one another and making broad gestures of protection. They carry and cradle each other and expand and collapse as though wrestling with the idea of connection and disconnection. While non-narrative (the story of Hadiya having been inspiration rather than narrative content), the piece expresses this idea with clarity of vision. Clarke-Springer sums it up best, expressing that she was "so intrigued by the beauty of her name that I was led to research it, finding the meaning 'spiritual guide' happened to be in complete alliance with the subject of my ballet. This ballet is not solely about this young lady. It's about all of our children, our loved ones, ourselves who find ourselves vulnerable to spiritual disconnection." Spirituality also serves as a theme for Natya Dance Theater, whose world premiere The Seventh Love, plays at the Harris on Saturday the 2nd. 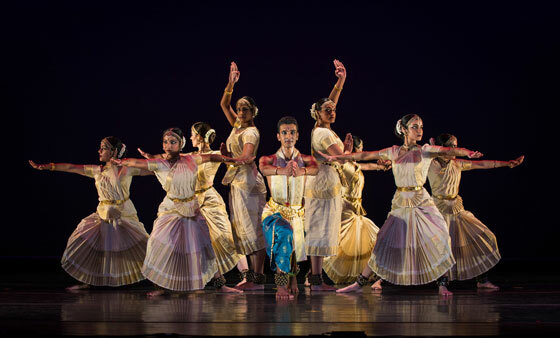 Natya Dance Theater is Chicago's critically-acclaimed and longest-running dance company rooted in the Indian dance-theater tradition of Bharata Natyam. The Seventh Love is a humorous dance drama revolving around the life of Krishna. Based on the ancient Buddhist discourse known as "The Five Aspects of Love," examines the life of Krishna through expressive dance. The piece also weaves in a real-life element by including true stories of Chicago women about their real-life relationships, ranging from anecdotes about arranged marriages to surviving domestic abuse to lessons learned from both failed and successful marriages. Natya will tell these traditional stories through a style of dance that takes traditional Indian form and uses it to create new choreography. It uses the traditional form and gestures as a jumping-off point for new choreography in much the same way as a new ballet might. The end result is a modern version of traditional Indian dance. Woven throughout the piece is the concept of love and divinity manifested in human relationships. By telling the traditional stories of Krishna's life and paralleling it to real life, the company hopes "the audience might recognize that they too are divine," according to Hema Rajagopalan, the company's Founder and Artistic Director. Is all of this getting a little heady? No worries, according to Rajagopalan, as the stories of Krishna are full of humor. When asked what audiences can expect from the performance, she expressed that the piece is it once traditional and modern, humorous and serious. Look for colorful costuming, beautiful professional Indian dance with a twist and some spiritual takeaways. Hadiya, choreographed by emerging choreographer Nicole Clarke-Springer, premieres as a part the program Generations which includes repertory piece The Dance We Dance Suite with choreography by established choreographers DRDT Artistic Director/Co-Founder Kevin Iega Jeff and Associate Artistic Director/Co-Founder Gary Abbott. Generations takes place Friday, Nov. 1 at 8pm. Tickets are $40-65; a $150 VIP ticket includes a post-performance reception with the choreographers and dancers. The Seventh Love was conceived by Natya Associate Artistic Director Krithika Rajagopalan in collaboration with David Kersnar, a founding member of Lookingglass Theatre, and was written and directed by Kersnar and choreographed by Natya founder and Artistic Director Hema Rajagopalan. Tickets range from $24 to $75. The Harris Theater is located at 205 E. Randolph St. Tickets for both are on sale at the Harris Theater box office, 312-334-7777 and harristheaterchicago.org.